To be included in the 5th supplement of the Catalogue raisonné currently being prepareed by Martin Dieterle and Claire Lebeau. There is little documentation on Corot's work of the 1840s. The artist travelled to Switzerland on several occasions and visited this country more often than any other, exploring Geneva and its surroundings (Montreux, Gex, Vevey, and Mornex, fig. 1) and the countryside of Dardagny where it is most likely the present work was painted. Corot's first visit to Switzerland was in 1834 after he returned from Italy, followed by a second visit in 1842. 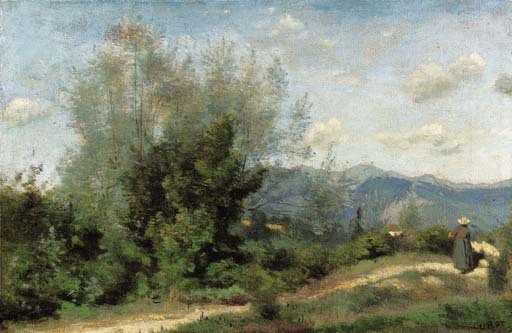 Ten years later Corot returned to Geneva with Leleux and his new friend Charles Daubigny and the three were united again the following year when it appears he visited Dardagny for the first time. One might assume that Corot's partly Swiss roots were the cause of his frequent visits, but it is also possible that his journeys were mainly connected with the large circle of friends he had there. Occasional records give an impression of these trips, such as the diary entry by a member of the Bovy family from La Boissière, August 1855 : 'The 27th, M. Corot works in Turrettini's fields in the morning, painting two charming studies... The 31st the dear M. Corot departs at 5am. His absence leaves a huge void' (Exh. cat., Corot, New York, p. 135).